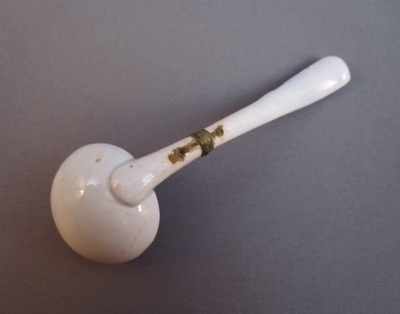 English miniature soft paste pottery pearlware ladle from set of child’s dishes, measuring 3-3/4″ long and dating from the early to middle 1800s. 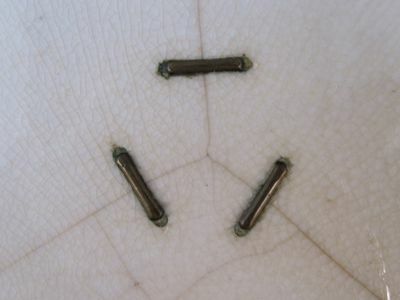 The two broken halves are bound together by a criss cross of thin brass wire woven through 2 tiny holes on either side of the break. Small dabs of cement in each hole help secure the repair. 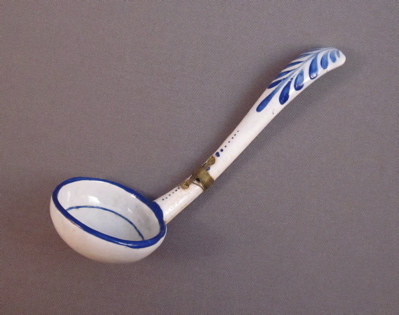 I pity the small child who briefly lost the use of their ladle during what might have been a fantasy feast. 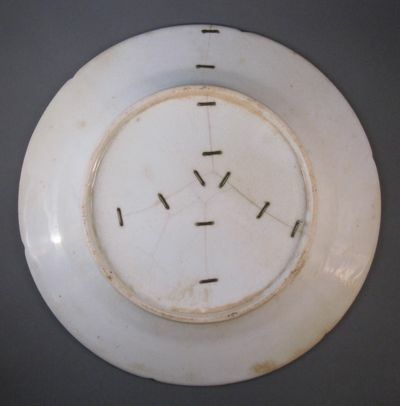 And I applaud the person who came to the rescue, making the two broken pieces whole again, thus allowing the imaginary dinner party to continue! 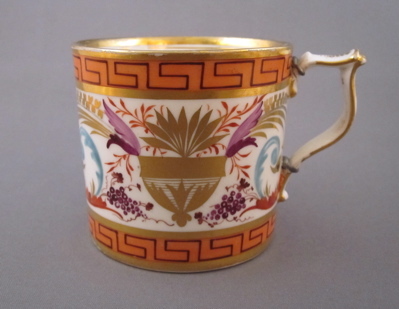 Colorful porcelain coffee can exquisitely decorated in the French style, made between 1806 and 1825 in London by Derby at their Nottingham Road factory. The wishbone form handle was detached over 150 years ago and riveted, soon afterward, back onto the body by a skilled metalsmith. 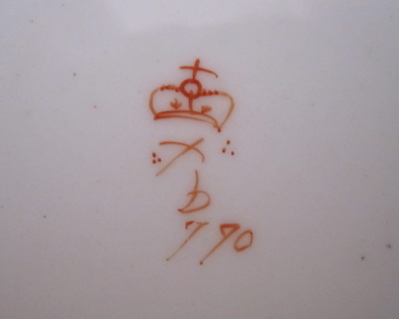 It is marked on the underside with a red crown, crossed batons a “D” and (pattern number) 770, all hand painted in red. 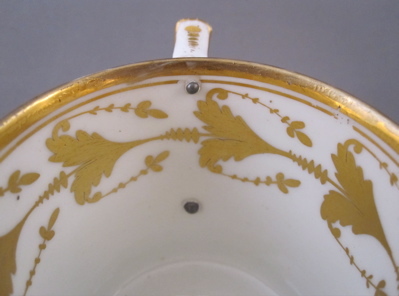 Now that I own two pieces from this stunning tea set, I am on the hunt to find the remaining pieces. 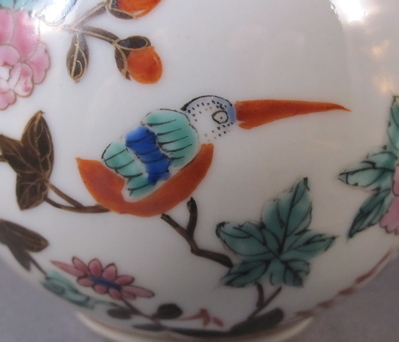 But naturally, I will turn away from “perfect” examples and only rescue the ones with inventive repairs! 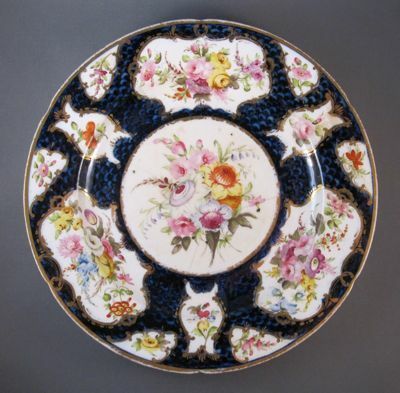 Porcelain plate made in England by Worcester in the late 1700s is brightly decorated with cartouches containing colorful floral sprays surrounded by gilt scrollwork and a scale background of mottled cobalt blue. 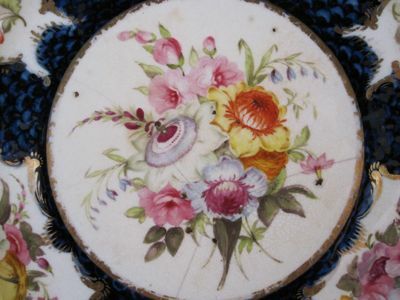 Unsigned plate measures 9-1/2″ in diameter. 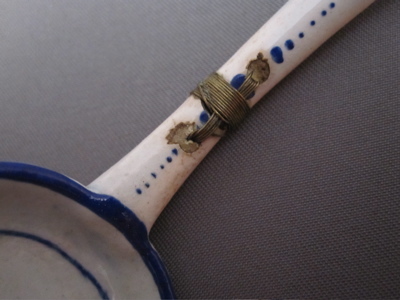 Although most items I have seen repaired with metal staples are holding multiple pieces back together, this plate has bronze staples stabilizing cracks against further damage. I like how the symmetrical pattern of the cracks and the staples form an almost perfect peace sign. 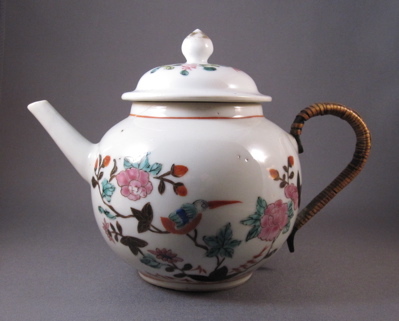 Chinese globular form porcelain teapot with underglaze decoration featuring a kingfisher and pink peonies in the famille rose palette. 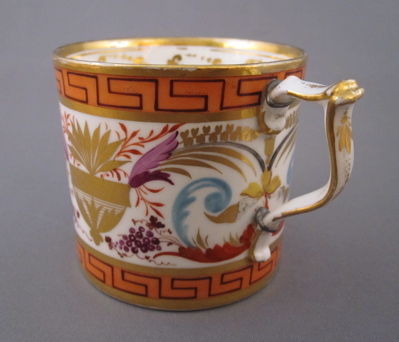 This popular form was made for export to North America and Europe in the mid 1700s. 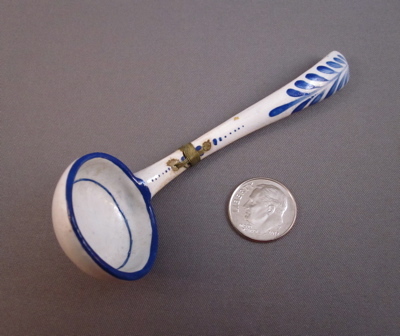 Teapot measures 5-1/2″ high and 7-3/4″ wide, from tip of spout to end of handle. 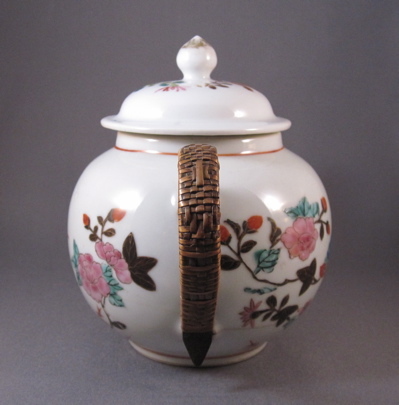 After the original porcelain loop handle broke off, a tinker formed a replacement using bronze covered in woven rattan. 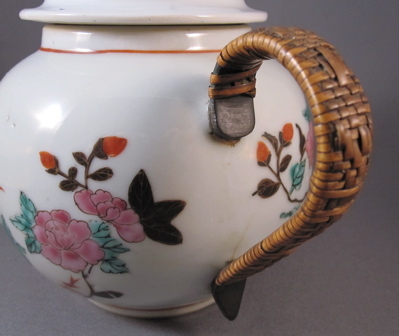 I have many examples of wrapped handles on teapots, each with slight variations. 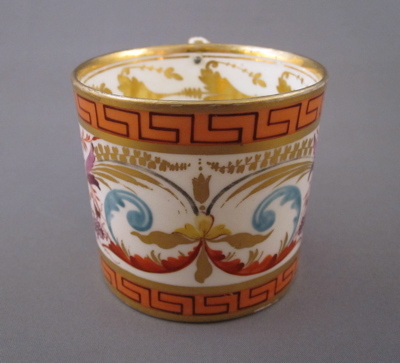 I am researching the different decorative patterns used and hope to identify the distinctions unique to each maker. 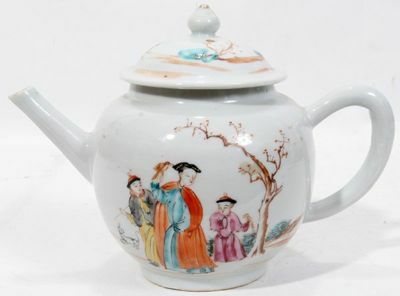 This globular teapot from the same period shows what the handle on my piece would have looked like before it broke off. 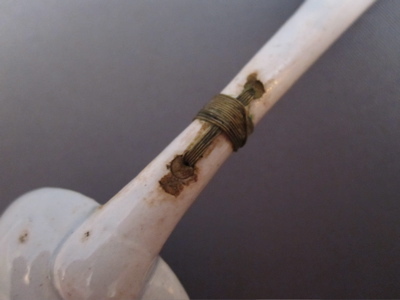 Antiques with inventive repairs (also known as "make-do" repairs) are unique examples of necessity and thrift, made during a time before Krazy Glue was invented. 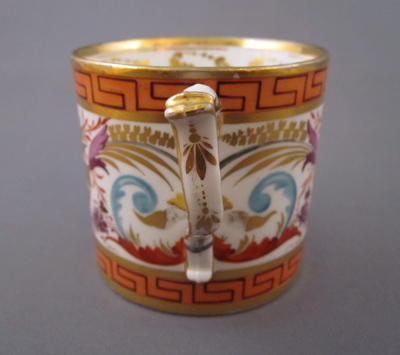 Unlike today where we discard anything chipped or cracked, broken household items were repaired at home or taken to a metalsmith to be brought back to life, often with whimsical results. 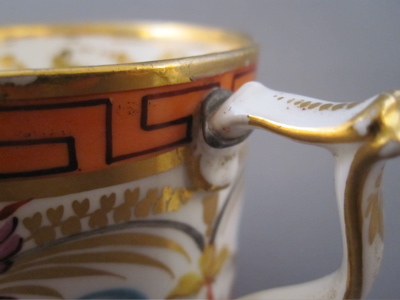 Once regarded merely as damaged goods by antiques dealers and collectors alike, antiques with inventive repairs are justly receiving the respect they deserve.